What I love most about the trailer for Ãgnes Kocsisâ€™ Adrienn PÃ¡l is the way that it captures a solemn, quiet beauty. Thereâ€™s something else too; a morbid bit of humour as a woman bites into a puff pastry while sharing the elevator with a dead body. 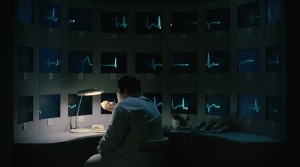 Adrienn PÃ¡l, Kocsisâ€™ second film and her second tour through Cannes, is the story of Piroska, an overweight nurse who spends her days staring at a wall of heart monitors and changing adult diapers. Sheâ€™s lonely, married to a man she doesnâ€™t care for and escaping from her days by retreating into childhood memories. When a woman sharing the same name as Piroskaâ€™s childhood best friend arrives and quickly dies at the hospital, Piroska sets off on a journey in search of her friend. The trailer for Kocsisâ€™ film is beautiful and by all accounts out of Cannes, the film is one to watch. The fact that it took home the FIPRESCI prize is a nice bonus. Wow, what a beautiful looking film.